Tag Archive | "LG BL40"
LG BL40 is a high end mobile phone especially designed for those who strive for both style and performance. This 3G enabled device gives you 24 hours internet access. But the main advantage is that you will have to pay only for the information you receive. This feature is also beneficial because it facilitates lot of applications with higher data rate transfer. The handset has got a crisp chocolaty look which can easily grab attention in the crowd. The 4.01 inches TFT wide screen gives you a cinematic view. It can show up to 16M colors with 345 x 800 pixels resolution. You can also take advantage of auto-rotate facility of the TFT screen for larger screen visibility. The display has got S-Class Touch user interface which makes all the operations quite easier for the users with a finger touch. You can view movies in the handset. The Dolby Mobile sound enhancement gives you perfect cinematic sound quality. The display screen is scratch protected and hence you can be ensured about the longer durability of the touch screen. You can spend your free time playing games on this device. But if have a hobby for photography then you can also enjoy your personal moments by taking beautiful snaps with 5MP camera. It has got a LED flash which will make your pictures brighter even at low light environment. Other features which is included in this wonderful camera phone are image stabilization, Geo-tagging, face, smile and blink detection, manual focus etc. The device allows to record videos with VGA@30fps (MP4). 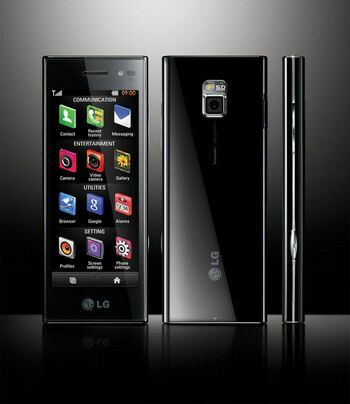 LG BL40 offers the users fastest messaging services. You can send SMS, EMS, MMS, Email messages to your friends or colleagues or chat with them via instant messenger. With this handset you can always stay in touch with your close ones. If you are a music lover then you might have lots of fun while listening to music with Stereo FM radio. This provides high quality audio which makes the music experience really sensational. The handset can assist you to organize your work schedule also. It has alarm clock and calendar. You can also remember the important dates or appointments with the reminder software in the handset. If you are away for long hours and need to stay connected with your contacts fort the whole day then the powerful battery support up to 370 hours stand by time and 5 hours of talk time will be of great help.